In this city whose storied excesses gave rise to Mullah Mohammed Omar and his puritanical Taliban, the old vices of the past are making a spirited comeback. Gambling, opium smoking and - in male-dominated Pashtun society, paedophilia - have all re-emerged as strict Taliban rule has disappeared. "Kandahari card trick!" a merchant exclaims on a night of card-playing - one of many well-known addictions of Kandahar's people, and one of many banned by the one-eyed Omar during the Taliban's five-year rule. Slapping down cards, the merchant comes to the point after several minutes of patter, saving the queens but tossing all the one-eyed jacks and kings out of the deck. "No more Mullah Omars!" the merchant cries. "Ha! Kandahari revenge!" To western eyes, Kandahar looks like no den of iniquity, just an overgrown version of any market town outside Kabul, the capital. Women bustle about on errands only under cover of silky full-length cloaks; there are no bars, or even teahouses, no movie theatres where men and women might mingle. But to Central Asians, Afghanistan's second-largest city is Babylon with burqas, Sodom and Gomorrah with sand. Security forces now are closing opium stalls and seeing to it that the racier selections in newly reopened video stores are kept under the counters. In a society where to flirt with women is to flirt with death at the hands of their angry male relatives, men turn elsewhere - sometimes to young boys. Even though such acts are banned in the Islamic religion, paedophilia has been a practice in Pashtun society. The Taliban tried to stamp it out, but with the stern militiamen gone from power, Kandaharis say the practice is coming back. In pre-Taliban times, the battling warlords who laid waste to this city also were known to argue over boys who caught their eyes. Local legend has it that Mullah Omar was first called from his mosque to settle one such feud, in 1994 - stepping in between two militia commanders and winning the return of a young abductee, although accounts differ as to whether it was a boy or girl. Citizens were so grateful, residents say, that the episode started the Muslim cleric on his rise to power. "I was beautiful. I never left home for a year and a half - I was that afraid," says Farid, a trader's son, recalling his ordeal nine years ago aged 11, when an Afghan commander took a liking to him from afar. Farid went into hiding, then into exile with an uncle in Pakistan. "That's why I grew a beard, and that's why I was happy the Taliban came, at first." 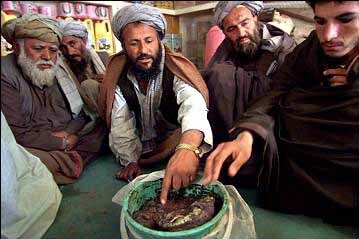 Some Kandaharis claim that was the origin of the Taliban edict ordering men to grow beards. The Taliban wanted to separate the boys from the men, to keep youngsters out of the army. 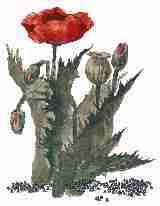 A Kandahari saying: He who does not smoke opium is a pumpkin-head. "It's a vice, but a small vice," says trader Amenullah, excusing himself for taking a crammed mouthful of Afghani nicotine-charged green snuff, while keeping an eye out for customers for the raw opium on offer at his stall. "Opium has come back a little - hashish, too, too much," one Kandahari says. Opium planting, banned under the Taliban, has surged. A local official, in fact, alleged that many of the thousands of southern Afghans planning a religious pilgrimage to Mecca this month paid for it out of opium profits. Afghan authorities, under pressure from western governments, are shutting down the opium stalls and promise to destroy the poppy crops in the spring. Kandahar's people say they are happy the Taliban are gone, and hopeful that order is here to stay after long years of war. Kandahar's security forces promise to keep it that way. "After 20 years, people are tired of it all," said Ahmad, a Kandahar commander. "Opium is banned now, hashish is banned. Don't worry. Everything will be banned."